Airport outfits can be a tricky category to navigate—balancing style with comfort isn't always easy, and when traveling we have a tendency to gravitate toward ensembles that look like we're lounging at home. When it comes to putting together your en route look, there's one item I suggest avoiding: Spandex (save this workout-appropriate material for the gym). Though I do support the athleisure trend, there are a number of effortless ways to look stylish and comfortable while traveling that do not involve the compact material. When deciding what to wear to the airport, lean into classic pieces that look put together while also ensuring physical comfort from your departure until you get to your destination. My suggestion? Opt for a laid-back look like jeans and a loose blouse for the airport. Some of my go-to traveling outfit pieces are stretchy jeans, an oversize blouse or thin sweater that can double as a blanket if you get cold, practical flats or sneakers, and a great carryall. Scroll down for my suggestion of what to wear to the airport and shop 13 of my travel-ready pieces. This breezy top makes for a great post-flight look. 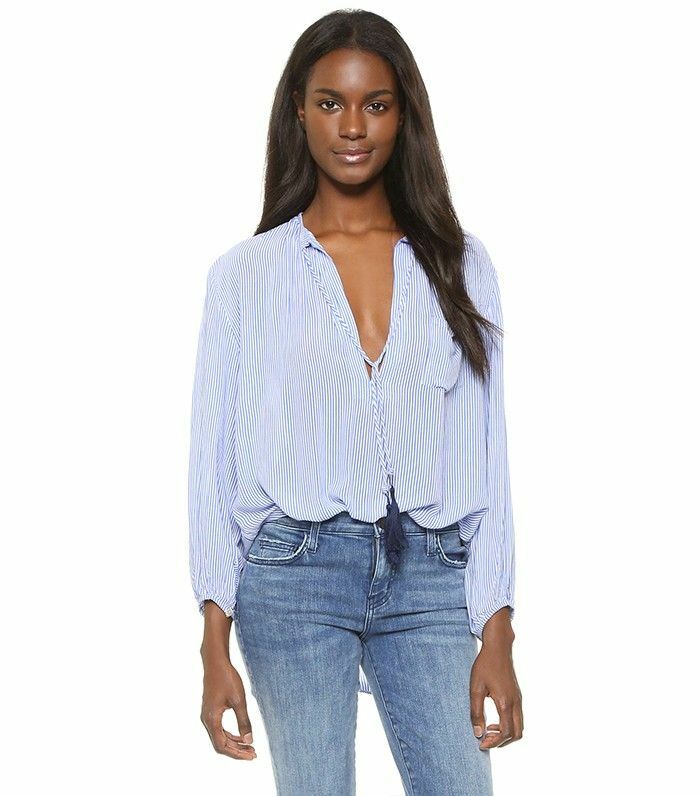 Swap your go-to denim for this updated wash. I love this ladylike tote. You can't go wrong with sleek white sneakers. Layer a leather jacket over this feminine tank. Denim with tremendous stretch is key. Add a pop of print to your airport outfit. A cozy knit is a must. The color is so great for fall. Pair this with your white sneakers and stretchy jeans, and you're set. This will fit all your in-flight essentials. This thin turtleneck will keep you perfectly warm. White sneakers not your thing? Try this sporty pair. This story was originally published on September 17, 2016 and has been updated.